New Citroën C5 Aircross SUV Hybrid Concept heralds the plug-in hybrid version of New Citroën C5 Aircross SUV, scheduled for launch in 2020. This is Citroën’s first plug-in hybrid and the first model in the brand’s “Low Emission Vehicle” offensive. The brand plans to launch a new LEV vehicle every year from 2020. New Citroën C5 Aircross SUV Hybrid Concept SUV is a versatile vehicle for customers looking for a “two-in-one” vehicle combining the benefits of electric driving (ZEV) for the daily urban commute and an internal-combustion engine for longer journeys. The advanced PHEV (plug-in-hybrid electric vehicle) technology of New Citroën C5 Aircross SUV Hybrid Concept adds a new dimension to the Citroën Advanced Comfort® programme: the pleasure of being able to drive in ZEV (Zero Emission Vehicle) mode silently while enjoying extended mobility and range of autonomy thanks to the combination of an electric motor and a combustion engine, both associated with an electrified EAT8 8-speed automatic gear box. New Citroën C5 Aircross SUV Hybrid Concept offers the ability to drive in all-electric mode, isolated from the outside world. Whilst the cocoon-like interior envelopes the passengers in a bubble of relaxation. It provides a solution for all types of use. ZEV mode allows you to drive up to 50 kilometres without emitting CO2. This range is suitable for most daily commuting needs. New Citroën C5 Aircross SUV Hybrid Concept really offers the best of both worlds: the ideal range for your daily commute and an ICE (Internal combustion engine) to take over for longer distances. New Citroën C5 Aircross SUV Hybrid Concept is fitted with a PureTech 180 (Euro 6.3) internal combustion engine and an 80 kW electric motor paired with the EAT8 8-speed Automatic gearbox. The EAT8 gains two upgrades, with optimised gear shifting and a “Brake” mode to slow the vehicle down without using the brake pedal. The vehicle manages the electric motor and internal combustion engine automatically, but you can select your driving mode: ZEV, Hybrid or Sport, via a selector available within easy reach of the driver on the center console. With New Citroën C5 Aircross SUV Hybrid Concept, the dials are easy to use, with the dedicated layout of the digital instrument cluster, speedometer, electric and fuel gauges, range in electric and ICE (Internal Combustion Engine) mode, an energy flow diagram and also, during the charging process, the remaining charging time, range, battery charge recovered, etc.). The 8'' touchscreen offers several pages dedicated to the hybrid drivetrain (energy flow diagram, consumption statistics, Eco coaching, etc.). The Citroën Connect Nav 3D navigation system includes a number of specific features such as electric charging areas. The MyCitroën app lets you schedule delayed charging, start or stop charging and view the battery charge level. Charging time is optimised: from a conventional socket overnight or from a 32A Wallbox (purchased or rented) in two hours. Charging is simple with the charging cables stored neatly under the boot floor. Citroën’s ambition is to be a key player in electric vehicle market by expanding its range of Low Emission Vehicles. Today, the brand already offers a range of electric vehicles covering the targeted needs of various customer groups: E-Berlingo, C-Zero and E-Mehari. With New Citroën C5 Aircross SUV Hybrid Concept, Citroën is making the transition to a broader range in which advanced Internal Combustion Engines (ICEs) and targeted electric vehicles will be available alongside all-electric and Plug-in hybrid models by 2020. 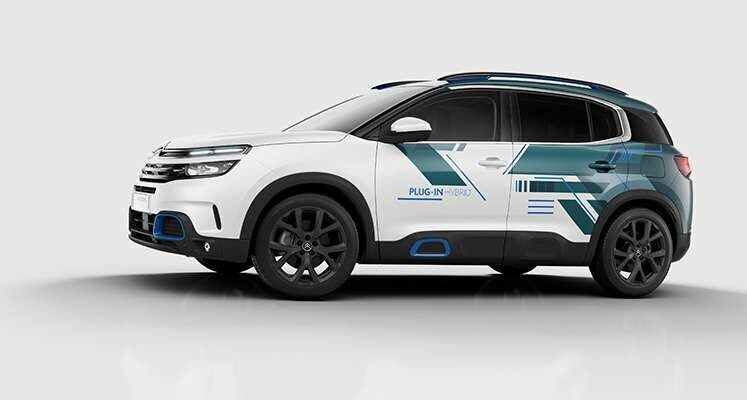 The future PHEV version of New C5 Aircross SUV, launched in 2020, will be Citroën’s first PHEV. It marks the first step in a process to electrify 80% of the range by 2023 and 100% by 2025. From New C5 Aircross SUV, all new brand models will be available in an electrified version.